FREDDIE AND BILLY TEST the new powers of Shazam. Last weekend I had a choice between watching an early screening of Shazam! or watching Captain Marvel. I’m glad to say I made the right decision. Shazam! felt like an old-school DC superhero movie in every way: emotional, charming, and powerful. When the film ended, I left the theater in high spirits; this was the type of film I’d longed to see from DC since Man of Steel. This film is, in my humble opinion, better than Wonder Woman, Aquaman, and dare I say it, The Dark Knight Rises. It’s the best film DC has made in the last decade. From start to finish, I, along with everyone else in the theater, was enthralled. For years I’ve been wanting a film like Batman Begins: a raw, old-school DC superhero origin movie. Shazam! is the closest any film has gotten to the gold standard that Batman Begins set almost 14 years ago. Shazam! has a lot of strengths, chief among which is its protagonist, Billy Batson. He’s exactly what you’d expect from a kid who’s been running from one foster home to another: quiet, brooding, streetwise, and every bit a “bad boy.” Inside, though, all he wants is his real mom, whom he got separated from when he was three. Later on in the film, we learn the soul-crushing reality of how and why it happened. I didn’t bother wiping the two tears that streaked down my face. I rarely cry in films, and I least expected to cry in one as goofy as Shazam!, but I did. This film has a beating heart and arich soul. The early screening I went to was packed with hyenas and seals. Or at least that’s what it sounded like, because this film generated endless laughter and emphatic clapping. Every single joke was on point, and there were some incredibly clever callbacks and references. In the final act of the film, there were two moments where I heard a storm of claps– each was incredibly powerful– which plastered a broad smile on my face. This film has underlying messages about masculinity and what it means to be a man. Without ever directly preaching to the audience, it gets a powerful message across by simply contrasting the attitudes of its hero and villain. While messages about self-reliance are necessary, it’s nice to see a film where a protagonist can only win by letting his friends and family help. Every man is a scared little boy inside, but he can still be a hero if he only chooses not to run from his fears. Something else I didn’t expect was the film’s very strong emphasis on family. The Shazam! comics have always had that focus, but this movie really nailed it in. I’m struggling to think of many films starring a teenage male protagonist, aimed at a teenage to adult audience, where the moral of the story is to grow closer to your family. Usually, films starring this type of protagonist are about going out into the world and finding yourself. At one point, Mary, a part of Billy’s Poster family is upset because of the thought of having to leave her family for college—I can’t think of a single film where that’s happened before. I’ve seen this theme in anime before, but rarely in American media. 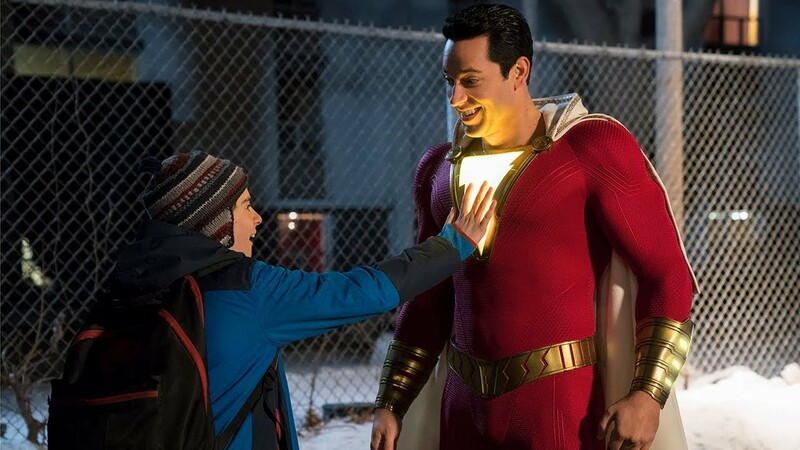 Whether this is a one-off, or a shift in western culture, Shazam! tackled this subject masterfully. The movie does have a couple issues. Although the villain is sympathetic, he’s somehow unimpressive at the same time. He had the base ingredients for a great villain, but they weren’t used to their full potential. He felt just a little generic. Another problem I could see people having is the wild tone shifts. This movie isn’t entirely comedic like Thor: Ragnarok. There are heart-wrenching scenes that are sandwiched right between light-hearted, fun ones. These tonal shifts might bother some, although it didn’t affect my enjoyment of the film. I had trouble figuring out why Batman v Superman, Captain Marvel, and so many other films failed where this one succeeded. As I walked out of the theater, a realization struck me, this film was unafraid to be what it wanted to be. It was both goofy and emotional, yet wholly unapologetic about it. It didn’t try to be a second rate version of some other movie because it was a first rate version of itself. Shazam! is definitely the most surprising film I’ve seen in recent years. It’s everything I’ve ever wanted from a DC movie, and I’m not going to lie, it felt great to hear the guys sitting next to me marvel about how epic this underdog of a film was.